Socialize, socialize, and socialize. You only have between the ages of 8 and 12 weeks of age to truly socialize these guys. Their little brains are like blank hard drives at this age, they’re busy downloading everything they experience. New things they experience (different ages, sizes, shapes, races of people, places, situations, even types of flooring, etc) are saved on their internal hard drives under “not scary”. Once that “socialization window” closes at 12 weeks, new things might then be categorized as “scary”. Thus, an adult dog that “hates men” might hate them because he never was around any during that critical socialization window, so when they finally saw one, he fell under the category of “scary”, and the dog responds by barking, acting fearful, etc. Take the pup to as many places as you safely can. I’d avoid the dog park until they’re fully vaccinated, but puppy class (starting as early as 7 weeks), family outings, friend’s houses, soccer practice, etc are good places to let the pup see the world. Potty Training. These are my observations from potty training my Lab, Mia: Baby puppies are pooping and peeing machines. Potty training takes time, persistence, consistency, and lots of patience (and cleaning products). They have 3 big lessons to learn. #1: Pooping outside is good. #2. Pooping inside is bad. #3. They can’t just go around peeing and pooping whenever they feel like it. They have to hold it until they’re in an acceptable location. Lesson #1 seems to be the easiest, they learn pretty quickly that going potty outside is good if you take them out after they wake up from naps, eat, or are sniffing around intently. Praise them like crazy when they eliminate outside. Lesson #2 requires persistence and vigilance. Every single time the pup has an accident in the house and gets away with it, his little brain registers that it’s A-ok to poop/pee in the house. With Mia, we literally had to set the oven timer to take her outside every 30 minutes to give her opportunities to do the right thing. She was so, so sneaky about covert urinating in the house that we would never catch her in the act. We crated her when we left the house and at night (in a small enough crate that she would have to stand in the accident if she had one). We finally caught her in the act enough times that we were able to scold her (squirt guns, or a loud noise, like a can loaded with penniesand shaken can be used as deterrents) so that she finally made the connection that eliminating in the house is unacceptable behavior. Lesson #3 I think is a developmental thing. The rule of thumb is that the number of hours a puppy can hold his urine is equal to the age in months plus 1. So a 2 month old pup should be able to hold it for 3 hours and so on. That seems to work best when they’re properly crated. Otherwise, they pretty much go whenever the fancy strikes them. So be patient and concentrate on teaching lessons #1 and 2, and I think #3 comes with age, maturity, and consistent, persistent owners. A word about indoor “puppy pads” a wise dog trainer once told me that those just “teach a dog to potty in the house”, so if you are ok with that, feel free to use those. Heartworm Preventative: There are two basic types of worms we commonly see in dogs. Intestinal parasites (hookworms, roundworms, tapeworms, whipworms (which are actual worms) and giardia, coccidia (microscopic protozoa). Most puppies have some kind of intestinal parasite that they get from their mom or their environment. That’s what we look for in the stool sample. Some of these bad boys can not only cause disease in dogs, but can also transmit to humans and cause serious problems. Heartworms do not inhabit the GI tract, thus are not detectable in stool. They are found in the dog‘s blood stream (thus it takes a blood test to diagnose it). Dogs (and cats) get infected by heartworms from the bite of a mosquito. The worms travel through the blood vessels and set up residence inside the heart. Over time, this leads to a myriad of problems including heart failure and death. We strongly recommend that all dogs take a monthly heartworm preventative year round. All heartworm preventatives “reach back” and kill whatever worms were injected into the dog the previous month. Heartworm preventatives also control the more common intestinal parasites. Sentinel $$ Y N Flavored tablet, birth control for fleas. Doesn’t kill adult fleas. Revolution $$$ Y Y Topical product. Also treats ear and sarcoptic mange mites. Nutrition: I get a lot of nutrition questions. The pet food industry took a beating with the Melamine issues from a few years ago. Unfortunately at this time there is no sure-fire way to judge the quality of a dog food. If you want to be 100% sure of what your dog is getting: go to www.balanceit.com and print out a recipe to cook for your dog. Otherwise, you are at the mercy of the dog food producers. Ingredient lists on the bags are sometimes not totally reflective of the quality of food that’s in the bag. Remember, we’re dealing with animals that eat poop, diapers, trash and dead things, so just because the ingredients are not human grade, doesn’t necessarily mean the food is evil for the dog (in my opinion). The ingredient list on a bag of Hills Science Diet dog food is terrible, by- products and such. However, I can’t refute the fact that dogs who eat that food are very healthy, with shiny coats, etc. The Hills people seem to squeeze plenty of nutrition out of those by-products. I see dogs that eat Beneful, (which is supposed to contain human grade healthy ingredients) who look scraggly and awful. My best advice is to feed a name brand puppy food for your size/breed of puppy (for example: Large breed puppy food is important for large breed pups to help control the advent of bone problems). If you’re curious, my dogs eat a mixture of Hills Prescription R/D (their ultra low fat formula) and Eukanuba Premium Protection. When she was a puppy, Mia, my lab ate Royal Canin Large Breed Puppy Food. How often should I feed my pup? My rule of thumb is three times a day ‘til they are over 5 pounds or so, then twice a day. Hopefully this avoids the hypoglycemia (or low blood sugar) that can affect little bitty dogs. How much should I feed my pup? Start with the mid range of the bag recommendations. See how much of that they scarf down in 10 minutes. If they inhale it and are starving then give them a little more. If they leave a little, maybe feed a little less next time, but pick the bowl and unused portion up after ten minutes. Don’t leave the food out all day and teach them to eat “ad lib”, this usually will eventually result in a fat dog. Be careful not to let them skip meals, as hypoglycemia is a big problem for pups that don’t eat properly. Some puppies aren’t fully weaned when they are sold to a new home and may need water or puppy formula mixed with their food to get them to eat. Give us a call if your puppy isn’t eating well. The amount you feed the pup will be frequently adjusted as he grows. You can generally switch to adult food around 8-10 months of age (especially in large breed dogs), for sure by 1 year. 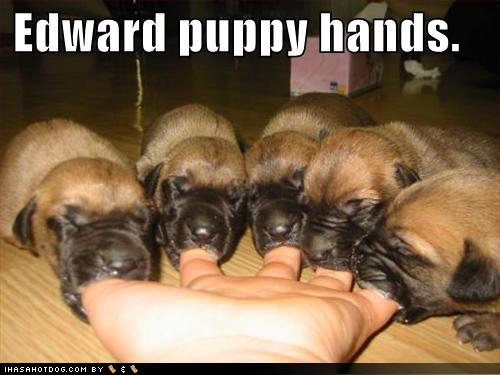 Biting and Chewing: Puppies are mouthy. They explore the world with their mouths. When Mia was a baby, my son wore oven mitts to play with her to protect his hands. We did a lot of “redirecting”. Whenever Mia tried to chew something inappropriate (like our hands, arms, skin, feet, legs, rear ends…you get the picture) we would tell her “no” and stick a proper chewing item in her mouth. Usually this was either a rawhide or one of her toys. It took some time and a lot of shouting of “REDIRECT” to the kids to remind them in times of Mia frenzy, but for the most part it worked. I think the Mia chewing damage was kept to a minimum (for a Lab) by keeping a LOT of “safe to chew” items around for her. A word about chew toys: I am pro-rawhide as long as it’s from America (foreign rawhides can contain nasty chemicals like formaldehyde), and not the super compressed kind. Keep an eye on the dog while he’s chewing, occasionally they can choke when they get down to a small piece that they then try to swallow. Common sense rules here too, if it makes him sick because he’s got a sensitive stomach, don’t give him any more. Another rule of thumb on chews is that you should be able to indent them with your finger nail. Too hard, and your dog could break a tooth chewing them. I don’t recommend the body part chews (chew hooves, pig ears, tracheas, “bully sticks”…which incidentally are penises) as they often contain harmful Salmonella or E. coli bacteria. We also don’t recommend those rope pull chew toys as they can unravel and the rope pieces swallowed. This can lead to potentially fatal linear foreign body (the strings get caught in the intestines, and can ultimately saw through them). Annually thereafter: Annual Exam, vaccines based on the pet’s lifestyle, to be determined by the vet. Heartworm test to make sure the heartworm medication is working and intestinal parasite test to make sure there are no potentially zoonotic (infectious to people) parasites affecting your pet. ANY time a pet gets a vaccination; there is a chance for an allergic reaction. The really bad ones happen within the first 15 minutes (these anaphylactic reactions generally happen before the pet leaves the vet and are characterized by vomiting, weakness, and shock). The other type of reaction is the more common “allergic” reaction that occurs usually within the first 2 hours of vaccinating. The pet often breaks out in “hives”, and has varying degrees of facial swelling. These patients should come back to the vet to get a steroid injection and Benadryl to stop the reaction. We will adjust the vaccination schedule to minimize chances of reactions in the future, and will usually pre-treat the patient with Benadryl. In the case of severe reactions, we may have to stop vaccinating all together. After vaccination I’d expect the puppy to be a little puny and quiet for up to 48 hours post shot. Muscle soreness and maybe a low grade fever are not unusual. Give us a call if you have any questions or concerns, in pups that are experiencing pain, we can send home a non-steroidal anti-inflammatory to help. 10. Still Have Questions? Write ‘em down. We will be seeing you approximately once a month early on to examine your puppy and get him or her through their puppy series of shots. I love when you bring your lists of questions, gives me something to talk about. Can’t wait that long? Give us a call, our illustrious front desk staff, technical staff or veterinarians can help during normal business hours. After hours? The Emergency Animal Clinic of Collin County is always open when we’re not to help. Their number is 214.547.9900. Our website: www.planovets.com is also chock full of basic pet care and clinic information. what type of puppies are in the picture? I have a puppy that someone found, but don’t know what type he is or how big he will get. Sorry, no idea, I just pulled the image off the web. They look like Boxer puppies if I was to hazard a guess.